At the invitation of State Councilor and Foreign Minister Wang Yi, Foreign Affairs Minister of the Republic of Chile Roberto Ampuero will pay an official visit to China from September 13 to 15. State Councilor and Foreign Minister Wang Yi will hold talks with Foreign Minister Ampuero. The two sides will have in-depth exchange of views on bilateral relations and international and regional issues of mutual interest. This visit will help deepen political mutual trust, expand common understandings on cooperation, and inject new impetus into the China-Chile comprehensive strategic partnership. Chile is an important country in both Latin America and Asia Pacific regions. It is also a comprehensive strategic partner for China. In recent years, under the strategic guidance of the leaders on both sides, China-Chile relations have been growing steadily with frequent high-level exchanges and fruitful cooperation in various fields. 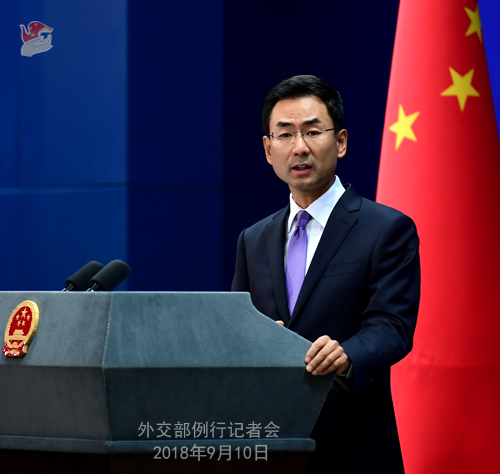 Under the new circumstances, China stands ready to work with Chile to maintain the momentum of all-around exchange, act on the opportunities brought by the Belt and Road Initiative to fully release the dividends of an upgraded bilateral free trade agreement, and elevate friendly ties and mutually beneficial cooperation between the two countries. Q: State Councilor and Foreign Minister Wang Yi visited Pakistan recently, right after US Secretary of State Mike Pompeo wrapped up his visit to that country. Could you tell us what are the considerations for State Councilor Wang's visit? What outcomes have been achieved? A: Not long ago, Pakistan formed a new government after successfully completing its election process. State Councilor and Foreign Minister Wang Yi's visit is aimed to coordinate with the new Pakistani administration and compare notes on cooperation across the board so as to ensure a good start for the China-Pakistan relations under the new circumstances. China and Pakistan are all-weather strategic cooperative partners. Our relationship is as stable as Mount Tai regardless of party differences and political transitions. The China-Pakistan friendship has withstood the test of the changing international situation and times. This unbreakable friendship is deeply rooted in the hearts of the two peoples. In the meantime, the development of China-Pakistan relationship is not targeted at any third party, nor will it be affected as each of us develops bilateral ties with other countries. During his visit, State Councilor Wang Yi met with Pakistan's President Arif Alvi, Prime Minister Imran Khan, Speaker of the National Assembly Asad Qaiser and leaders of the military, and held talks with Minister of Foreign Affairs Shah Mehmood Qureshi. The two sides exchanged in-depth views on deepening the China-Pakistan all-weather strategic cooperative partnership and other international and regional issues of mutual concern and reached many consensuses. Politically, the two sides will further deepen strategic mutual trust and strengthen strategic communication. We will also more staunchly support each other's core and major interests and more closely communicate and coordinate with each other on major issues of mutual interest. Economically, the two sides will step up development cooperation with focus on people's livelihood. China will give more assistance on a priority basis to such areas as agriculture, education, medical service and drinking water, delivering tangible benefits to more people. The two sides will enhance the building of the China-Pakistan Economic Corridor, and decide the future development path and the course for cooperation through negotiations in light of Pakistan's next-stage socio-economic development priorities and the needs of its people. We will prioritize the faster development of industrial cooperation and livelihood projects, gradually extend them to the western part of Pakistan and enable more Pakistanis to benefit from the CPEC. In terms of security, the two sides decide to bolster defense and security cooperation. We will promote exchanges between our militaries and law-enforcement institutes and firmly crack down on the East Turkestan Islamic Movement. China will support Pakistan in continuing to resolutely fight terrorism in accordance with its national conditions. Pakistan's new government has stressed many times that it will continue to regard its relations with China as the cornerstone of its foreign policies. Likewise, China will continue to prioritize Pakistan in its foreign policies and neighborhood diplomacy. China is ready to work with the new Pakistani administration to forge China-Pakistan relations into a model of good neighborliness, a pillar of regional peace and stability, and an exemplar of the Belt and Road Initiative. Q: Last week, the US side threatened to place duties on almost all Chinese exports into the United States. What is your response to this? A: My colleague from the Commerce Ministry has already responded to similar questions. I just want to reiterate that if the US insists on imposing new tariff measures on China, the Chinese side will surely take countermeasures to safeguard our legitimate rights and interests. Q: The Human Rights Watch in New York today accused China of suppressing Uighurs in Xinjiang. What is your reaction to that? A: This organization has formed a habit of treating China with prejudice, distorting facts and stirring up troubles. So, I don't want to make any specific response to its accusations or remarks. As for the situation in Xinjiang you mentioned, I want to say that Xinjiang is enjoying overall social stability, sound economic development and harmonious co-existence of different ethnic groups. It is a wish shared by people of all ethnic groups for Xinjiang to maintain enduring social stability, since it serves their fundamental interests. The series of measures implemented in Xinjiang are meant to improve stability, development, solidarity and people's livelihood, crack down on ethnic separatist activities and violent and terrorist crimes, safeguard national security, and protect people's life and property. Another point I want to make is that the Chinese government protect citizens' right to freedom of religious belief in accordance with the law, and people of all ethnic groups fully enjoy such right in accordance with the law. Q: The US State Department said last week that it is recalling its top diplomats from the Dominican Republic, El Salvador and Panama. This follows each of these countries' decision to establish diplomatic ties with China. They previously had them with Taiwan. What is your response to this move? 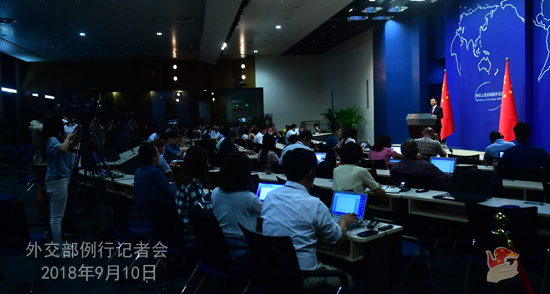 A: The one-China principle is a consensus shared by the international community. It is based on this principle that China established diplomatic ties with the relevant countries in accordance with international law and basic norms governing international relations, as well as the fundamental interests of the people not only in China but also in these countries. This is a well-justified decision in response to the call of the times. A sovereign country can choose with whom it wishes to develop diplomatic ties, because it has the sovereign right to do so. Such right should be respected, and other countries are in no position to say otherwise. Our advice for the relevant country is that it should not forget the fact that it established diplomatic ties with the People's Republic of China decades ago on the basis of acknowledging the one-China principle. It should adopt a correct view of other countries' establishment of diplomatic ties with China, cautiously and properly handle Taiwan-related issues, and refrain from further saying or doing anything irresponsible for the sake of its own image and cross-Strait peace and stability. Q: Just now you gave an elaborate reply to State Councilor and Foreign Minister Wang Yi's visit to Pakistan. 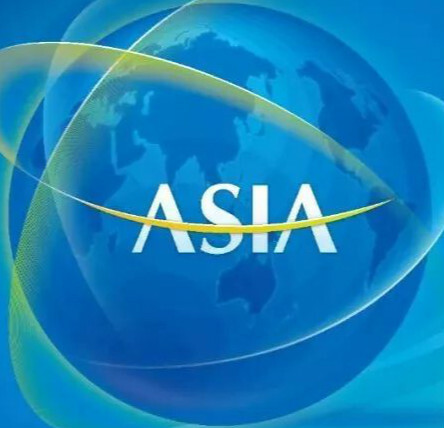 The Pakistani media has noted that there was no announcement of any new economic aid to Pakistan, as the country is reeling under the economic crisis under the new government. Was there any assistance commitment from China to Pakistan? A: China and Pakistan are all-weather strategic cooperative partners. Our friendship gets reflected not only in the political area but also in economic cooperation. China and Pakistan have made remarkable achievements in the building of the CPEC. During his visit to Pakistan, State Councilor and Foreign Minister Wang Yi reached important consensus with the Pakistani side on accelerating the building of the CPEC. As I just said, the two sides decided to determine the future development path and the course for cooperation under the CPEC through negotiations in light of Pakistan's next-stage socio-economic development priorities and the needs of its people. Priorities will be given to speeding up industrial cooperation and livelihood projects, and we will gradually extend them to the western part of Pakistan and enable more Pakistanis to benefit from the CPEC. 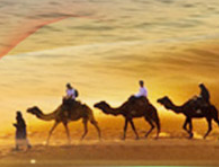 The aim of the CPEC is to benefit the Pakistani people and deliver tangible benefits to the ordinary Pakistanis. Q: The DPRK held a military parade yesterday to celebrate its founding anniversary. Special Representative of President Xi Jinping also attended the military parade. What is your comment? A: Li Zhanshu, Special Representative of General Secretary of the CPC Central Committee and Chinese President Xi Jinping, Member of the Standing Committee of the Political Bureau of the CPC Central Committee and Chairman of the Standing Committee of the National People's Congress led a delegation of the CPC and the Chinese government to visit the DPRK and attended the celebration events marking the 70th anniversary of the DPRK's founding. It showcased the great importance China attaches to its relationship with the DPRK and represented China's warm congratulations to the DPRK's 70th founding anniversary. During his stay in the DPRK, Special Representative Li Zhanshu met with Chairman Kim Jong-un and handed over a letter from General Secretary Xi Jinping. You may all have read news about that. I want to add that together with the heads of other delegations who were invited to attend the 70th anniversary, Special Representative Li Zhanshu attended a range of celebration events. What's special about this year's celebration, as many media noted in their reports, is that the DPRK demonstrated more of its achievements in the economic field and its determination to improve its economy and people's livelihood. On the Korean Peninsula issue, China's position is firm and clear. 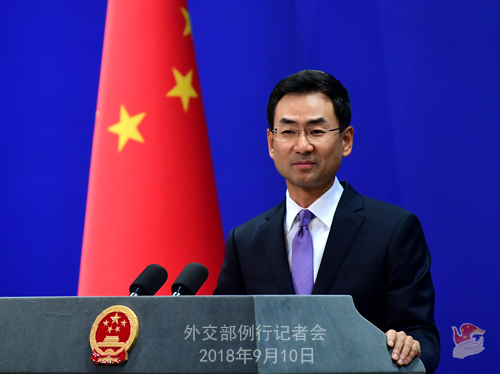 China remains committed to the denuclearization of the Peninsula and to upholding peace and stability on the Peninsula. Meanwhile, as a friendly neighbor of the DPRK, China stands ready to consolidate friendship with the DPRK and support the DPRK in improving its economy and people's livelihood.